I LOVE brunch. It's my favorite meal of the week! One day I dream of owning a brunch restaurant. I often think of all of the awesome things that would be on my menu. A girl can dream, right? My favorite brunch beverage is a bellini. There's nothing better than a champagne flute filled with bubbly and a kiss of peach nectar, mmmm. I had my first bellini in Venice at Harry's bar (where bellini's are said to have originated). It was one of Hemingway's favorite places to sit and write - or so I'm told. Regardless, I was introduced to the bellini and I was forever changed. When I think of a boozy brunch the first two drinks that come to mind are mimosas and bloody marys. I love an excuse to pop open a little bubbly, and brunch is the perfect excuse! Bloody marys on the other hand aren't my favorite. Yes, I said it, I'm not a fan. To me it tastes like cold spiced tomato soup with vodka, yuck! That being said, I know that it's a favorite among many and making a good bloody mary is a desired skill. 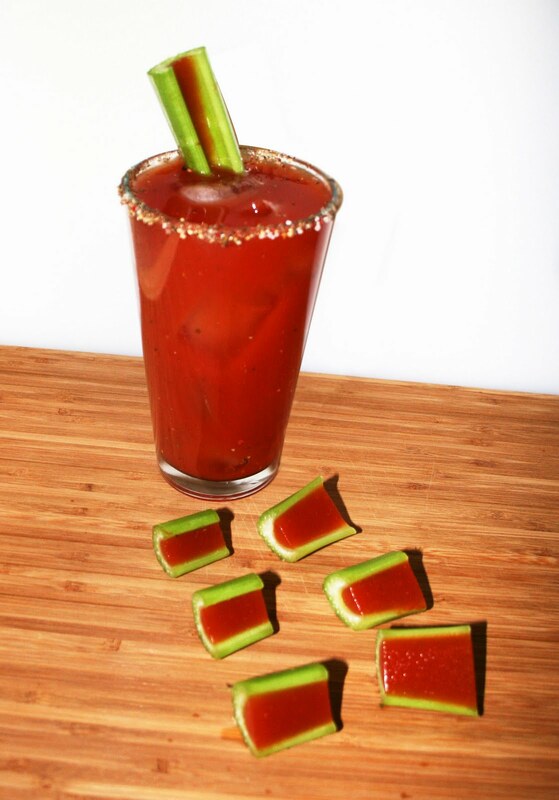 I was thinking about how to put a fun twist on brunch when suddenly it hit me... jello shots, BLOODY MARY JELLO SHOTS! No? Sound weird? SO! To me it sounded like fun and I don't even like bloody marys. I decided to take my wacky idea and run with it. I've seen people make jello shots in orange peels so why not make a breakfast version and do bloody mary jello shots in celery sticks?! Maybe I'm crazy but I think it's fun. I know my sorority sisters would love them, too! I showed up to brunch at my cousins with these little bite sized shots and my whole family thought I was nuts. The only way to describe them is by saying trippy. I love when a dish can take you to a place you've never been before. Sort of like the first time I had jalapeno chocolate ice cream. It was cold and spicy and it totally confused and excited my taste buds. 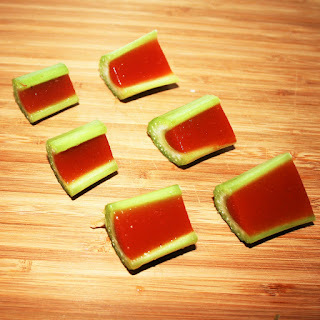 These jello shots are crunchy but jelly and a little spicy and cold... it's a unique experience! They're very unique and fun. They take a little time to make but they're worth it for the wow factor. 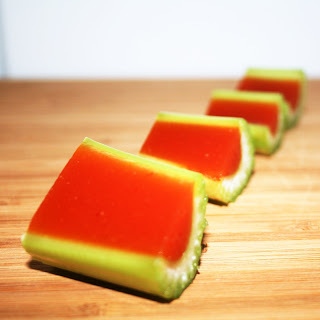 Try them and let me know if you think jello shots belong at the brunch table. They're sure to be the center of conversation among your brunchees. Mix all ingredients except the vodka, gelatin, and celery stalks in a pot over medium heat. When liquid is warmed, add gelatin and stir until dissolved. Pull mixture off the heat and let cool for 1 minute. Add vodka and then pour into celery stalks. I put my celery stalks in a casserole dish so that the liquid wouldn't pour out. See the image below for reference. Some of the mixture will spill out but it's ok... you'll have plenty! I let my mixture sit for 3 minutes before I poured it into the celery stalks. Place in fridge to set for at least 4 hours. Cut into bite sized pieces and enjoy! WARNING: do not attempt to swallow whole! These jello shots are meant to be chewed. you can use clamato juice or veggie juice instead of tomato. you can add your favorite bloody mary spices... jalapeno or pepperoni sticks would be an interesting twist. you can also make these in different vessels other than celery sticks, like inside of a jalapeno, pepperoncini or cherry tomato. 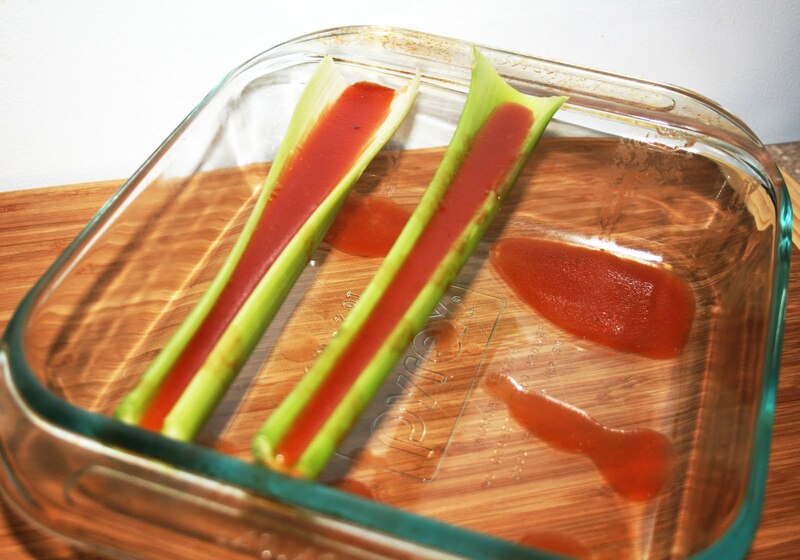 you can also make them in regular cups if you don't have the celery sticks or the patience to make them. if you have a favorite spice style for your bloody mary's, use that instead. This is very flexible aside from the gelatin to liquid ratio... keep that the same. ginger would be a great spice to add in the mix. Great creativity, I liked your concepts. These dishes look so colorful and I must say after reading your blog, I have to arrange best boozy brunch nyc with my colleagues. This is a really good read for me about decorative concrete this topic Must admit that you are one of the best bloggers I ever saw.Thanks for posting this informative article.